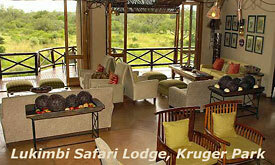 16 spacious suites combine luxury and modern African decor with private decks and river views. 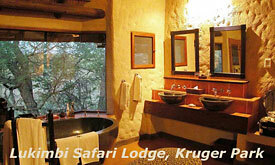 Our Giant Eagle Owl and King Cheetah suites each include a private pool and second bathroom. 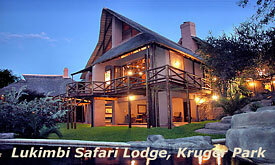 The lodge features carved plaster panels showing intricate mystical creatures and African patterns, in a subtle yet extremely decorative way. 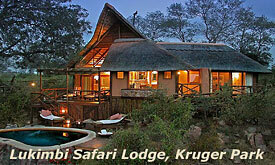 The main buildings are linked together with open wooden decks, making the most of the view, as the lodge meanders along the banks of the river Lwakahle. Anybody who is reasonably fit and healthy, and is looking for something adventurous will certainly enjoy "bushwacking" on foot. There are emergency evacuation points along the route if there is any kind of problem. 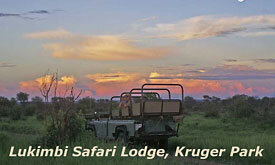 The Wagon Trail, the Lwakahle Trail and the Gabro Trail depart at approx 07h00 and guests will return back to camp around 17h00. 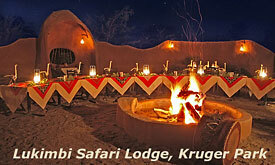 Lukimbi can take a maximum of 8 guests, from 16+ years on a walk. 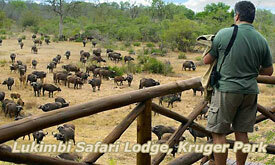 Guests do need to request the full day walk at time of reservation, as it is subject to availability and there is a huge amount of logistics involved. 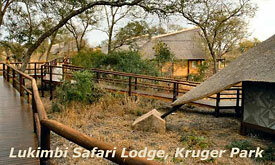 There is an additional charge of R550.00 per person per walk.